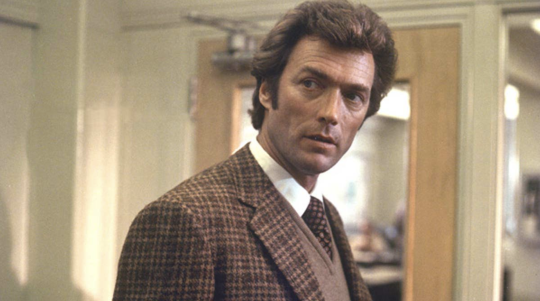 “Dirty” Harry Callahan fought many bad guys across five films between the years 1971 and 1988, from a serial killer named Scorpio to violent revolutionaries to a gang of seaside rapists. But one of his most persistent foes lived off screen, which didn’t keep her from becoming a kind of obsession for the film series Harry called home. Directed by Don Siegel, Dirty Harry quickly became the subject of controversy and condemnation — as everyone making it no doubt knew it would, with its casual endorsement of police power and dismissal of accused criminals’ rights. 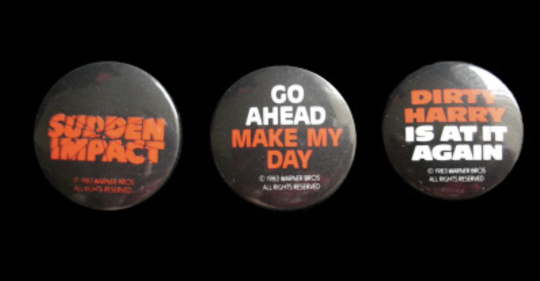 But few were as vocal in their condemnation as Pauline Kael, who pinned on the series, and its star, an f-word both would have a hard time shaking. 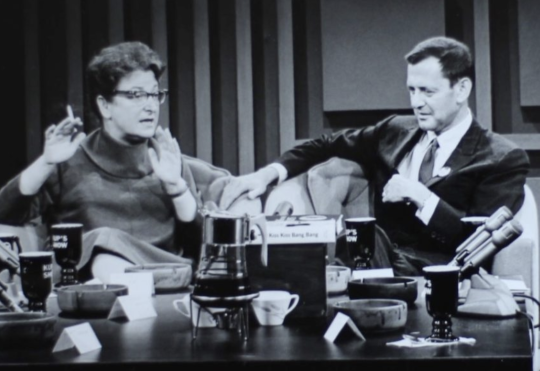 The “action genre has always had a fascist potential,” wrote Kael in The New Yorker, “and it has finally surfaced.” The review locked Callahan and Kael in a battle that would continue until both retired, leaving no clear winner at its end. But, hey, at least it’s art, right? As for Dirty Harry, Kael had no such measured kindness, apart from admitting it’s a “stunningly well-made genre piece.” Under the headline “Saint Cop,” Kael attempted something between an analysis and a dismantling of the film. 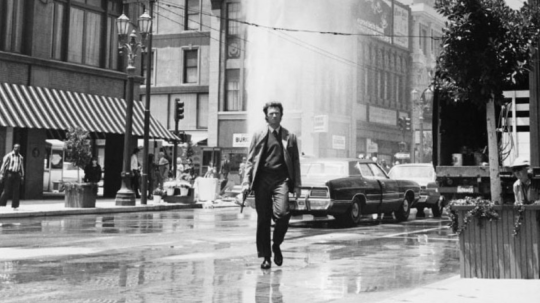 After some memories of growing up in San Francisco and being told to avoid the police, she states, “Dirty Harry is not about the actual San Francisco police force; it’s about a right-wing fantasy of that police force as a group helplessly emasculated by unrealistic liberals.” That’s just a build-up to a review that largely pushes the film’s aesthetic qualities to the side to attack what she perceived to be its one-sided morality. Kael took particular objection to the stacked deck narrative of a script (credited to the husband and wife team of Harry Frink and R.M. Frink and Dean Reisner, though John Milius, Terrence Malick, and others also took uncredited passes) that ignores the complicated causes of criminality in favor of a simplistic clash between good and evil that blames irresponsible bleeding heart liberals with their Miranda rights and concerns about unchecked police brutality getting in the way of justice. The scene begins simply enough, with Harry trying to get a quick bite at a regular haunt (a hot dog joint conveniently located around the corner from a theater playing Eastwood’s directorial debut, Play Misty for Me). But Harry can’t eat in peace. There’s a tan Ford with its engine running outside a bank and he knows it’s up to no good. So he asks the proprietor to call the police and plans to lay back and relax—until the alarms start blaring. His hand is on his gun before he’s out the door, and it’s no standard-issue pistol, either, as he’ll soon explain, but a .44 Magnum, a gun originally designed for short-range hunting. A gunfight breaks out. Harry takes down one of the robbers as he tries to make it to the getaway car. A second one makes it, but Harry then shoots the driver as he tries to flee, forcing the car to swerve and hit a fire hydrant then flip on its side. More gunfire follows, and Harry kills the passenger-side robber after he escapes from the wreckage. It’s Harry’s first target, the sole survivor, who’ll be on the receiving end of his monologue about what a .44 Magnum can do to a man’s head. But before the speech, there’s the walk. Harry, still chewing his hot dog, looks down and sees a spot of blood on his pants form a flesh wound. Then, as water shoots in the air and witnesses scream in horror, he strides over to the bank, gun at his side. It’s a gunslinger’s walk, and though Dirty Harry will change that, up to this point Eastwood has been best known as a Western actor. The first of his five collaborations with Siegel, 1968’s Coogan’s Bluff, was as much Western as police thriller, and the pair double down on that imagery here. Only everything about the moment seems wrong. Here’s a lawman administering justice from behind the barrel of a powerful gun, like an old-fashioned Western hero (even if Eastwood rarely played that type of Western hero). But he’s out of place in modern San Francisco, and those screams around him could just as easily be at the horror of what he’s done as the the fear that the criminals will carry the day. It’s also the rare scene in which Siegel chooses not to utilize Lalo Schifrin’s score, which he’ll employ to tremendous effect elsewhere, and often to make Harry’s actions seem as horrific as they are heroic. 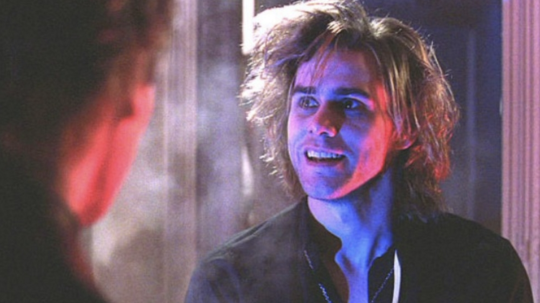 When Harry arrests Scorpio after shooting him in the middle of Kezar Stadium (then recently abandoned by the San Francisco 49ers), he first shoots him in the leg then tortures him by stepping on his wound, demanding he reveal the location of a girl he’s kidnapped while Scorpio pleads for his life and writhes in pain. On the soundtrack, Schifrin’s music sounds like it could just as easily accompany a horror movie. Then, in an extraordinary helicopter shot, the camera pulls back and offer’s a God’s eye view of the fog enshrouded-stadium. From a distance, it’s hard to see who’s the cop and who’s the criminal, only that some horrific bit of abuse is happening. And then both fade from view. Harry’s right. Because Harry’s always right. Scorpio snivels and whines but the girl dies anyway. And then Scorpio gets away because Harry has mistreated him. “People were angry with a certain erosion of justice, erosion of a sense of the law protecting them,” Milius says in the documentary The Long Shadow of Dirty Harry. The film ultimately feeds into that anger, but in that moment at least, it’s hard not to wonder if justice that’s this ugly is really justice at all. Then there’s the phone call. 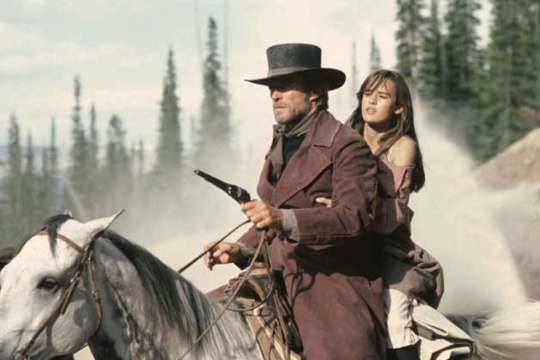 In his 1996 biography Clint Eastwood, critic and Eastwood pal Richard Schickel recounts a conversation Eastwood claims to have had with Kael in which she admitted she was “just a dumpy little movie critic, and I have to do that,” after admitting she wrote things she didn’t really mean. Schickel takes the claim at face value. Eastwood’s erstwhile partner Sondra Locke, on the other hand, claims he made the whole thing up. Kael didn’t bite and sensed she was being pandered to. “They are explicit versions of what we accused Harry of being,” she wrote. “They might be the earlier Harry’s disciples.” Rather than unpack the politics further, she instead revived her complaints about the original film, threw barbs at Eastwood’s acting, (“the first truly stoned hero in the history of movies”) and his general presence (“only his hands seem fully alive”), and worried some more about the state of movie violence. If she found too little complexity in Dirty Harry, however, it’s hard to say the same about Magnum Force, which suffers from the absence of Siegel and the pedestrian direction of TV veteran Post (though Post would later complain that Eastwood’s interference prevented him from making the film he wanted). An unsettling, morally ambiguous Dirty Harry proved far more compelling than one who seemed neutered by criticism. Ditto the Harry of The Enforcer (1976), which benefits from a relationship between Harry and his new female partner (played by Tyne Daly), but otherwise continues the series’ descent, particularly in a scene that plays Harry’s propensity to shoot first and destroy property to comic effect. 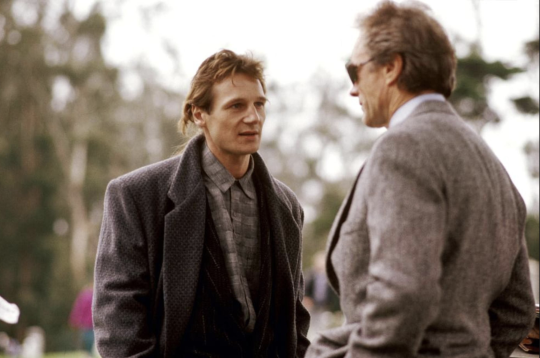 Harry bounced back considerably with the Eastwood-directed Sudden Impact (1983), which returned the series to its roots, for better and worse, via scenes of queasy-making violence against black criminals and added a layer of sexual psychodrama via a female vigilante (Locke) seeking revenge on the rapists who put her sister in a coma years before. It’s an odd film that mixes De Palma-like luridness with silly moments of comic relief (usually in the form of a farting bulldog), but also the one entry that justifies Eastwood retrieving the badge Harry discards at the end of the original from the San Francisco Bay. The same can’t be said of 1988’s The Dead Pool, which brings the Harry/Eastwood saga to its conclusion in the stupidest way possible. 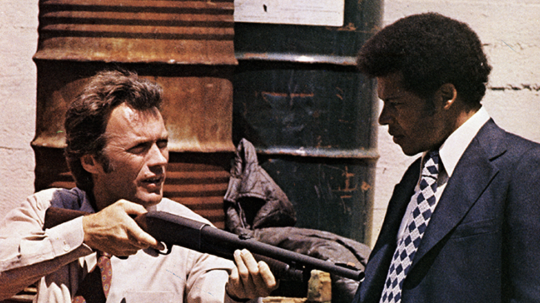 In the years after Magnum Force, Kael had refrained from writing about the Dirty Harry films beyond dismissive capsule reviews, and she had written dismissively of Eastwood’s directorial efforts. (The Gauntlet: “You look at the screen even though there’s nothing to occupy your mind.” Pale Rider: “a bust” Bird: “When a man who isn’t an artist makes an art film, it’s just what they expect art to be: earnest and lifeless.”) “She considered it a sign,” Brian Kellow writes in his biography Pauline Kael: A Life in the Dark, “of the way movies had gone off track that Martin Scorsese was now (she believed) in decline, and Robert Altman was all but a back number—yet Eastwood’s star remained as potent as ever.” Eastwood had no reason to grow fonder of her, or to keep her from being slain by a serial killer. Fictionally, of course. Scripted by Steve Sharon and directed by Eastwood’s former stunt double Buddy Van Horn, The Dead Pool finds Harry tracking a killer who’s somehow related to a new slasher film being filmed in town by loutish, ponytailed horror veteran Peter Swan (Liam Neeson) and starring drugged-out rock star Johnny Squares (Jim Carrey). ** Also involved, a “dead pool” game in which the participants predict which celebrity will die next. The list includes both Harry, now a local celebrity, and a San Francisco film critic named Molly Fisher (Ronnie Claire Edwards), who bears more than a passing resemblance to Kael. First briefly glimpsed joylessly panning a comedy on local television, Fisher exists mostly to look like Kael and to die at the hands of an unseen killer who shows up and menaces her with a knife. “Please,” she gasps. “I have a heart condition.” “A critic with a heart,” he replies. “That’s a laugh.” Asked her honest opinion about Swan’s films, she says, “I… I like them.” In her last moment, she does what Eastwood claimed Kael had told him she did, tailoring her opinion for her audience. The killer calls Fisher a liar and stabs her to death. It’s the cheapest of shots, but it barely lands in the midst of its dull surroundings. The Dead Pool is an awful movie, one with only a passing resemblance to the film that made Dirty Harry famous and little to set it part from a dozen anonymous ‘80s crime thrillers apart from some alarming low points, like a silly chase between a police cruiser and a remote controlled car. Harry ended his career a shadow of his former self, with everything that once made him seem dangerous or provocative drained away. So who got the last laugh? It’s a tough call. Her Parkinson’s disease worsening, Kael retired in 1991, before she got a chance to comment on Eastwood’s further uptick in respectability in the ‘90s, a shift in opinion that began in earnest with the release of Unforgiven, a 1992 Western that explores violence and its relationship with the character of America, and which won four Academy Awards, including Best Picture and Best Director. But would Eastwood, who had nothing left to prove as a movie star as the ‘80s became the ‘90s, have pushed himself as an artist quite as hard without the doubts of Kael and others echoing in his head? And while Kael’s Dirty Harry review can be read as an example of Kael’s difficulty in engaging with certain types of movies and their stars—in spite of her habit championing disreputable art she uses “genre” in the piece like it’s a dirty word — it also exemplifies the passionate engagement and cutting observations that made her the most influential critic of her era, one who knew that movies mattered and the fantasies they beamed back to us didn’t always reflect well on those watching. The hammer of Harry’s gun clicks on an empty chamber and the punk’s head doesn’t get blown clean off, but would audiences have cheered or revolted if it had? Both the film and its sharpest critic seem united in not knowing the answer, and justifiably fearing it. * Played by an uncredited Albert Popwell, who’d have major supporting roles as different characters in the first three Dirty Harry sequels. ** Yes, seeing both of those actors in those roles is pretty strange, almost as strange as when Carrey performs a “Squares” song by lip-synching to “Welcome to the Jungle.” A young Patricia Clarkson plays Harry’s love interest, too.